Just last week we announced our new site EveryoneCreates.org, in which we showcase stories of people who rely on the open internet and various internet platforms to create artwork of all kinds -- from music to books to movies to photographs and more. It appears that we're not the only ones to be thinking about this. The Re:Create coalition has just now released some fantastic economic research about the large and growing population of people who use internet platforms to create and to make money from their creations. It fits right in with the point that we made, that contrary to the RIAA, MPAA and its front groups like "Creative Future," the internet is not harming creators, it's enabling them by the millions (and allowing them to make much more money as well). Indeed, the report almost certainly significantly undercounts the number of content creators making money on the internet these days, as it only explores nine platforms: Amazon Publishing, eBay, Etsy, Instagram, Shapeways, Tumblr, Twitch, WordPress and YouTube. Those are all great, and probably cover a decent subset of creators and how they make money -- but it leaves off tons of others, including Kickstarter, Patreon, IndieGogo, Wattpad, Bandcamp, Apple, Spotify and many other platforms that have increasingly become central to the way in which creators make their money. Still, even with this smaller subset of creative platforms, the study is impressive. 14.8 million people used those platforms to earn approximately $5.9 billion in 2016. Let's repeat that. The internet -- which some legacy entertainment types keep insisting are "killing" content creators and making it "impossible" to make money -- enabled nearly 15 million people to earn nearly $6 billion in 2016. And, again, that doesn't even include things like Kickstarter or Patreon (in 2016 alone, Kickstarter had $580 million in pledges...). In short, just as we've been saying for years, while those who rely on the old legacy gatekeeper system of waiting until you're "discovered" by a label/studio/publisher and then hoping they'll do all the work to make you rich and famous, maybe that's a bit more difficult these days. But, for actual creators, today is an astounding, unprecedented period of opportunity. It is impossible to determine an average income for members of the new creative economy, because earnings vary so widely for each platform. As previously stated, this analysis includes only a single source of income for each of the nine platforms. For instance, based on the current data, we include a YouTube star’s earnings from YouTube but not revenues as influencers or advertisements on other social media platforms. Also interesting is how the report found that creators are spread all over the US. 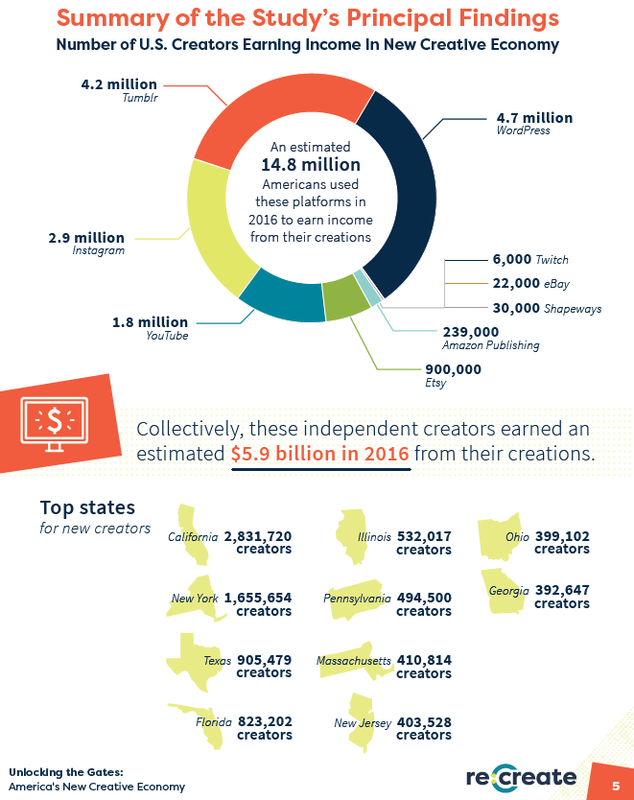 While California, New York and Texas have the most creators, even those with the "smallest" numbers of creators (Wyoming and the Dakotas) still had tens of thousands of people using these platforms to make money. And, yes, in case you're wondering, the study excluded big time stars like Kim Kardashian using platforms like Instagram to make money, focusing instead on truly independent creators. This is especially important, as it's coming at a time when the RIAA, MPAA and their friends continue their nonsensical claims that these very same internet platforms are somehow "harming" content creators, and that laws need to change to make it harder for everyday people to use these platforms to express their artwork and to make money off of it. It's almost as if those legacy gatekeepers don't like the competition or the fact that people are realizing they don't need to work with a gatekeeper to create and to make money these days. So, once again, it's time to dump the ridiculous myth of "tech v. content." That's not true at all. As this report shows, these tech platforms have enabled many millions of people to earn billions of dollars that's only possible because they're open platforms that get past the old gatekeeper system. Share your story at EveryoneCreates.org to let policymakers know how important an open internet and fair use is to your own creativity. "Your connection is not secure" -- "The owner of everyonecreates.org has configured their website improperly. To protect your information from being stolen, Tor Browser has not connected to this website." "everyonecreates.org uses an invalid security certificate. The certificate is not trusted because the issuer certificate is unknown. The server might not be sending the appropriate intermediate certificates. An additional root certificate may need to be imported." Whatta ya tryna pull there? And/or: Why doncha fix that? Having skimmed apparently all, I can now say happily: Good luck with the new site, Masnick!